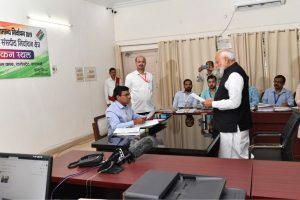 The Bharatiya Janata Party (BJP) on Tuesday launched the “Mera parivar, Bhajapa parivar” (‘My family, BJP family’) campaign ahead of the Lok Sabha elections to bolster its base at the grassroots level. Top BJP leaders, led by president Amit Shah, hoisted the party flag at their homes in support of the campaign. Many prominent leaders posted photos online to show their commitment to the party and encourage supporters. Shah put up the saffron-and-green flag containing the party’s lotus symbol at his home in Gujarat. Gujarat Chief Minister Vijay Rupani’s family, too, hoisted the flag at his home at Rajkot. 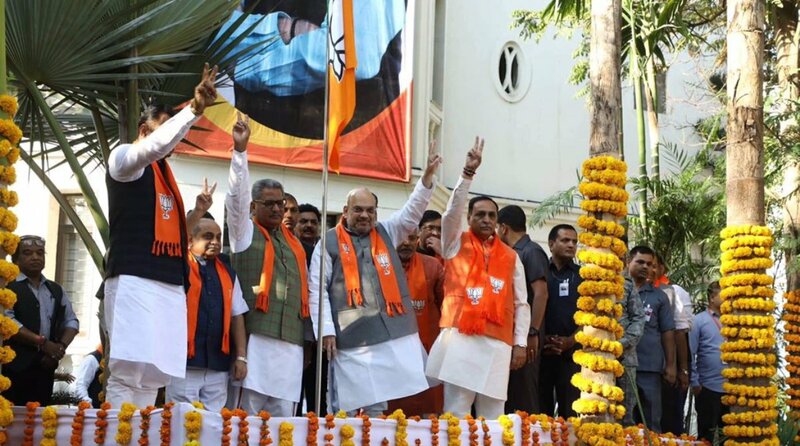 Rupani had also accompanied Shah at the launch of the event in Ahmedabad. Himachal Pradesh Chief Minister Jai Ram Thakur hoisted the party flag on the house of prominent party workers in Shimla under ‘Mera Parivar BJP Parivar’ campaign. Education Minister Suresh Bhardwaj and OSD to the Chief Minister Mohinder Dharmani were also present on the occasion. “Let the voice of 5 crore karyakartas echo across the nation. Be a part of our family and strengthen this journey towards progress and development,” wrote Assam Chief Minister Sarbananda Sonowal on Twitter after hoisting the party flag. Tripura Chief Minister Biplab Kumar Deb hoisted the flag in his assembly constituency of Banmalipur. Uttar Pradesh Chief Minister Yogi Adityanath hoisted the party flag at the home of party worker Abhishek Balmiki in Lucknow’s Daliganj. Former Karnataka Chief Minister BS Yeddyurappa, too, hoisted the party flag at his home. The party’s flag campaign will continue till 2 March and is aimed at covering over five crore houses of its workers and supporters across the country. According to the BJP, the campaign might touch 20 crore people if every house that puts up the flag has an average of four residents.